Where observation is concerned chance favours the prepared eye. As this is a new project the news section is subsequently scant but I will begin to update with any news of current work, exhibitions and projects and so on. I thought that I might also post some blogs on the painting process itself and anything that's relevant to my attempts to paint properly. This can some times seem like a Sisyphean task. 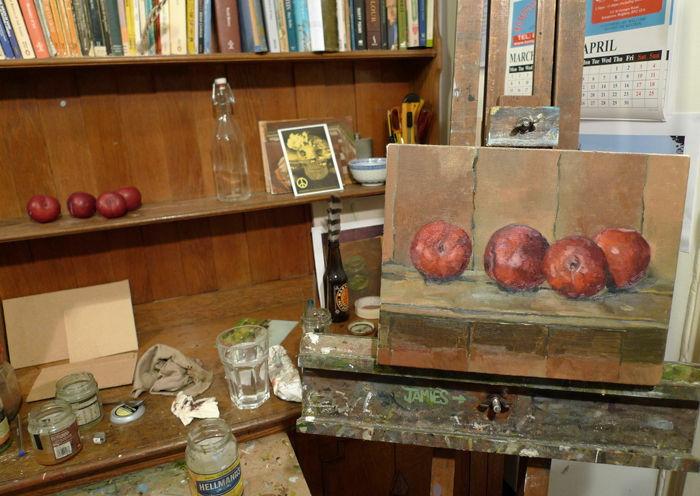 I think a good place start are simple still life studies. Less is more! This is the equivalent of pre season training to a footballer. It's also fundamental to your practice. Looking might sound like an easy thing to do, but it isn't. When we believe we are seeing objects we are seeing only ourselves. Degas said that In painting you must convey the idea of true by means of the false. You see the problem. Still Life painting, whether just a single Lemon or a multitude of objects is all about training your brain to be dispassionate, cold, concentrated, to clinically dissect the object into space, colour and line. And here's my cramped little still life shelf where I try to see and like a blind man usually fail. But try again to fail better. Someone, I can't remember who, said that you always have to spoil a painting a little in order to finish it. Too true!